The Mountains to Sound Greenway is a success story about people who wanted to make a difference. What began as the vision of a group of hikers more than 20 years ago has become part of the Pacific Northwest’s living legacy. Stretching over 100 miles between Seattle and Central Washington, the Greenway surrounds Interstate 90 with a spectacular landscape of viable outdoor spaces, vibrant communities, opportunities for outdoor recreation and accessible connections to the area’s rich history and culture. At 1.5 million acres, the Mountains to Sound Greenway is bounded by major watersheds, the Cedar River at the south and the Tolt River at the north. It is framed by the urban areas of Seattle and Ellensburg and woven together by the Interstate 90 highway and an extensive network of trails that link the public to the Greenway landscape. The Mountains to Sound Greenway is a designated National Scenic Byway. It gives travelers along Interstate 90 sweeping views of open spaces, vibrant communities, wildlife, history and culture, working farms and forests, and outdoor recreation, all within minutes of the 15th largest metropolis in the nation. The Mountains to Sound Greenway Trust is the non-profit organization behind the landscape. It includes a coalition of environmentalists and timber companies; developers and farmers; federal and state agencies; cities and counties; nonprofits and businesses. Although the viewpoints are diverse, the vision is unanimous: healthy, vital, livable communities and sustainable natural lands. Since its inception in 1991, the Greenway Trust has played an important role in supporting local communities as they pursue a sustainable future. Greenway partners want help with marketing and economic development, but they also want guidance in following the Greenway model of hands-on stewardship and education. With years of experience facilitating land acquisitions, trail planning, volunteerism and environmental education, the Greenway has important resources to offer towns and cities as they work with local residents to build sustainable, economically vibrant communities. Partnerships are the backbone of success in the Greenway. Many cities and towns in the region look to help from the Greenway Trust to run a large-scale volunteer restoration project, locate a new trail, or manage a science-based outdoor education program. Projects on the ground can help connect a community to the surrounding landscape and foster a sense of personal responsibility for the natural world. This is where the Greenway Trust comes in, helping to engage volunteers in ecological restoration, reaching youth through education and service learning and connecting communities by filling gaps in an extensive regional trail system. 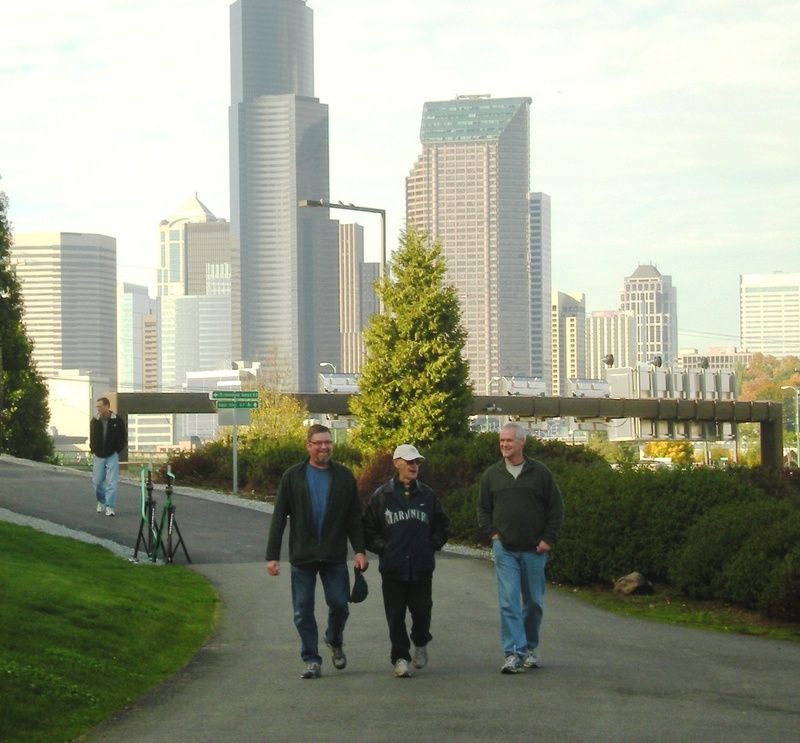 A recent project in Seattle is a prime example of how the Greenway Trust coordinates efforts with partners. With the support of the Trust, the City of Seattle, the Seattle Department of Transportation, the Washington State Department of Transportation, and many community groups worked together to fill a critical regional trail link in Seattle’s Beacon Hill neighborhood, connecting the trail along I-90 to downtown. The new trail runs through Dr. José Rizal Park and allows safe, off-road access to the stadium district as it crosses over Interstate-5 at Holgate Street. It is a trail project that was decades in the making and is considered to be a major collaborative success for the area. 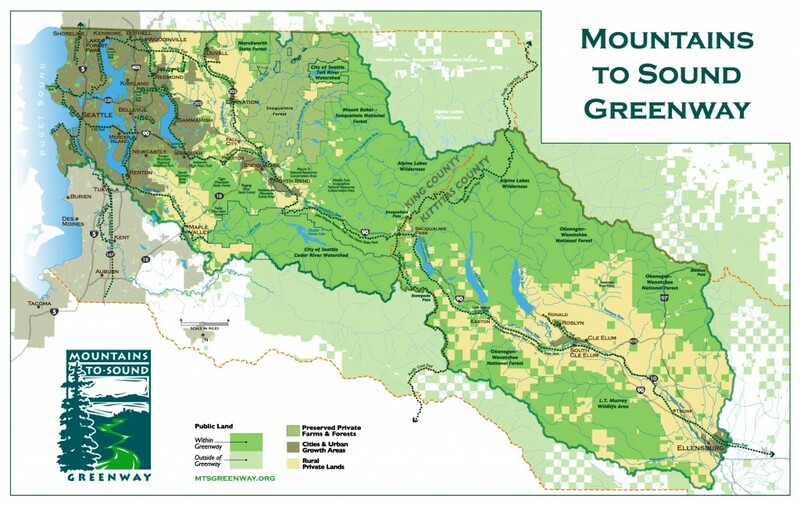 After two successful decades of working in the region, the Mountains to Sound Greenway Trust held public planning sessions focusing on the next twenty years with hundreds of local partners, including city governments, businesses, environmental groups, citizen activists and federal land managers. These discussions led to the conclusion that it is time to make the Greenway a National Heritage Area. The definition of a National Heritage Area as per the National Park Service website is a “large lived-in iconic area” which describes the historic, scenic and recreational elements that make the Greenway a nationally distinct landscape worthy of this type of recognition. The National Park Service recommends identifying themes to illustrate the unique qualities of the heritage area and to provide a broad conceptual framework under which to interpret natural, historic, cultural, and recreational resources. The single idea that best captures the history and culture of the Mountains to Sound Greenway is the interconnectedness of humans and nature. For thousands of years, the landscape of the Greenway has shaped travel routes, driven commerce and culture, and inspired bold acts of exploitation followed in more recent years by groundbreaking conservation efforts. The designation of the Mountains to Sound Greenway as a National Heritage Area by the U.S. Congress is a key strategy in preserving this iconic landscape. Formal recognition of the Greenway will strengthen a sense of place, enhance funding opportunities, empower partners to work together more efficiently, and formalize the Greenway coalition’s cooperative management style across this broad landscape.